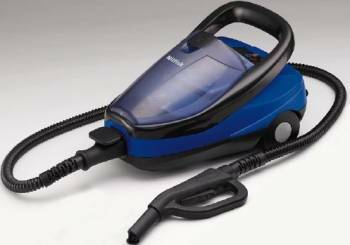 The Nilfisk Steamtec 5 IH is the only machine in the range of Nilfisk Comsumer / Domestic Steam Cleaners which has continuous filling. The Steamtec 5 IH has the advantage of being able to refill the container while working due to the cleverly designed twin heating tank system. This design also means a short heat up time is needed when starting work. As with the other machine in the range, It has a comfortable carrying handle, various accessories, & a stainless steel boiler, which makes it suitable for multi purpose cleaning / disinfection tasks both indoors & out.